The Green Skill Development Programme (GSDP) of the Ministry of Environment Forest and Climate Change (MoEFCC) is an initiative for skill development in the environment and forest sector to enable India’s youth to get gainful and/or self-employment. The programme endeavours to develop green skilled workers having technical knowledge and commitment to sustainable development. It is hoped that this will help in the attainment of the Nationally Determined Contributions (NDCs), Sustainable Development Goals (SDGs), National Biodiversity Targets (NBTs), as well as Waste Management Rules (2016). According to the Environment Minister Dr. Harsh Vardhan, the GSDP targets to impart green skills to 80,000 people. 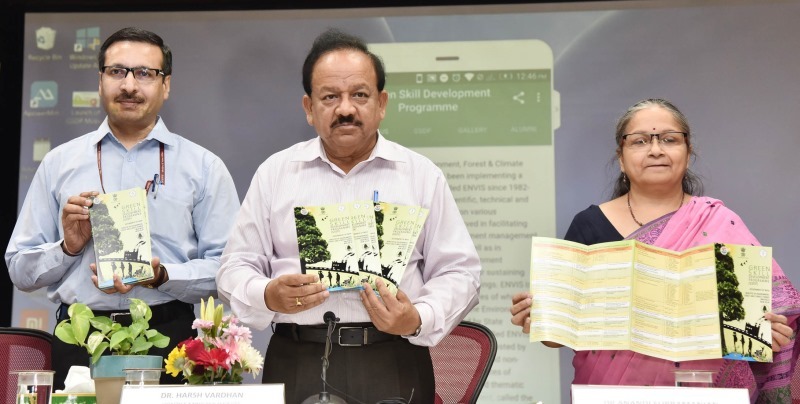 Speaking after launching the Mobile App of Green Skill Development Programme (GSDP) at the Ministry premises in New Delhi, Dr. Harsh Vardhan pointed out that more than 30 programmes have been identified, which will be conducted in 84 institutions across the country. He also stressed that such an initiative will complement the vision of the Prime Minister, Shri Narendra Modi, of skilling India’s youth and strengthening the resolve to conserve and protect the environment. The pilot project of GSDP was launched in June, 2017, for skilling Biodiversity Conservationists (Basic Course) and Para-taxonomists (Advance Course) of 3 months duration each at 10 locations, spread over 9 bio-geographic regions of the country. 94 trainees successfully completed the basic course qualifying as skilled Biodiversity Conservationists and 152 Trainees completed the Advanced Course qualifying as skilled Para-taxonomists. ENVIS Centres of the Ministry in Botanical Survey of India (BSI), Zoological Survey of India (ZSI) and their respective regional offices were the nodal Centres for these pilot programme.